Why get only the part of a discussion and comments that a given news site is willing for you to see? Every news site seems to be guilty of censuring comments that “offend” it, with no transparency of its adherence of capriciousness in excluding or deleting comments the editors simply find too ideologically uncomfortable to their agenda. If it’s on-topic, properly documented, factual and logically reasoned, avoiding crude language (and doesn’t violate copyright or other laws), then IJN will put it in front of your eyes. What miso-Judaic PC is TV news or print media spinning about Yi•sᵊr•â•eilꞋ or Yᵊhud•imꞋ now? ABC? BBC? CBS? CNN? France24 (English)? NBC? Yet another Fox (Christian News?) host pushing Christian / Catholic symbols or celebrations in-your-face on non-Christians on public property again? “Occupied territories”? Is an Israeli or Jewish news outlet (Ynetnews, Jerusalem Post, Israel National News (Arutz Sheva), haAretz, Jewish Weekly, etc.)? Article in print media (newspapers, magazines, etc.) off-the-rails about some topic of Ta•na”khꞋ, Ha•lâkh•âhꞋ, Yi•sᵊr•â•eilꞋ, Yᵊhud•imꞋ or relating to the non-Jewish world? Miso-Judaism in American foreign policy or election politics relative to Yi•sᵊr•â•eilꞋ or Yᵊhud•imꞋ? Shortcomings in American, European, Israeli or other counter-terror strategy against Muslim Jihadist terrorism? Israel security, foreign policy and relations with the Christian world. American foreign policy vis-à-vis Yi•sᵊr•â•eilꞋ, e.g., moving the American embassy from Tel Aviv to Yᵊru•shâ•laꞋyim. Perversion of prohibiting Yᵊhud•imꞋ from praying on Har ha–BaꞋyit! Report of Yᵊhud•imꞋ discriminated from living in an area because mᵊzuz•otꞋ are prohibited? Report of pro-Islam indoctrination in American elementary school books or university courses? What about divisions in the global and Israeli Jewish community; Ultra-Orthodox / Kha•reid•imꞋ vs Orthodox and non-Orthodox? How should Yᵊhud•imꞋ interface with the rest of the world, historical facts and science, including Christianity vs the Judaic Mâ•shiꞋakh (Mâ•shiꞋakh Bën-Yo•seiphꞋ and Mâ•shiꞋakh Bën-Dâ•widꞋ)? Mi•tzᵊw•otꞋ and Ha•lâkh•âhꞋ: medieval or logical? Is prohibition of electricity or writing on Shabat valid Ha•lâkh•âhꞋ? Is it Rosh ha-Shân•âhꞋ beginning the year or Yom Tᵊru•âhꞋ in the middle of the year? Qitniyot (legumes & beans) during Khag ha–Matz•otꞋ? Swinging a chicken on Yom ha–Ki•pur•imꞋ? Some verse of Ta•na”khꞋ you have a question about? May I please know alternative place to purchase your books? Schueller Publishing is not available. I’m learning and want to go through your steps but unable to get the materials. Thank you and may you be blessed. Thanks for your inquiry. I respect and admire your interest in living the practice of Torah. כל הכבוד! Two things that most newbies have most difficulty recognizing is the absolute indispensable requirement of both 1. learning the basics of Hebrew and 2. transitioning into the global Jewish community to guide you in countless minor questions of daily practice. The latter will ultimately determine whether your practice is, indeed, conforming to Torah — as understood by the people who wrote Tanakh in their own language rather than as perverted by Hellenist idolaters. Although my books and Israeli website (www.netzarim.co.il) are indeed invaluable in providing the core information you will need, it will be your (not my) Hebrew-dependent daily work of study and resolve that changes your life practice to conform to Torah — again, as practiced by the people of Tanakh rather than idolaters. But further, even within the community of global Jews, it’s essential to restore the originalist interpretation of Halakhah — as practiced by the ancient Israelis, as opposed to products of Dark Ages European assimilation tradition prevalent in the Jewish world today. The Hebrew you can get from various on-line Israeli courses. Just make sure you’re getting an Israeli accent, not an Ashkenazi, European-assimilated, accent (and certainly not German-bastardized Yiddish). I try to always provide a link to my source book whenever I refer to it. That will usually take you to our on-line Netzarim Shop where you can obtain the book. That said, all of my books and papers are available in the Netzarim Shop pages of our on-line Israel Mall (click the “Israel Mall” icon in the Navigation panel, always at the left of our website pages). Then, at the bottom of the resulting page, see the Judaica Shoppes and click the Netzarim Shoppe icon. Then click whichever of the 4 aisles icons, within the shoppe, that you prefer to visit. I’ve tried to make our on-line Netzarim Quarter (NQ) Village Park as theme-intuitive as I could. You can visit everywhere in NQ the same way. The best way is to familiarize yourself with the entirety of NQ — by taking the bus tour from the very beginning, through to the end. Hope this helps. Stick with it as a life practice and your life will flourish in the most meaningful Ways. Curious because I’d learn much in a group with interaction. Like all other public forums (Twitter being somewhat exceptional in this regard), Facebook’s RC (religiously correct) censorship has always given free rein for RC advocates to argue, criticize and even defame me and the נְצָרִים while censoring our rebuttals, which have always been backed by indisputable hard evidence — and the public never had an opportunity to see. That makes our own blog, the only venue which we can ensure airs proper evidence and logic — as well as filtering idolatry, logical fallacies, denials of science, historical documentation and archeological hard evidence — the only option. If the blog host eventually censors our discussions then this won’t even any longer be an option. “Yeshua” is just another form of the Christian Jesus — which enables them to remain within Christianity (simultaneously excluding them from any stream of Judaism). While they appear the same to those who haven’t learned better, there are no Orthodox Judaism groups like the נְצָרִים. If they were the same they would have conformed to נְצָרִים standards and become נְצָרִים. They have not, do not and are not. As I’ve told you: if you want to learn, the info is — exclusively — in our website. Start with a complete read-through of ALL of the pages in our History Museum. It’s evident you have not. You learn from knowledge, which is in our website. You merely judge casuistry in the settings you seem to prefer. Sounds like you need to make a choice. It seems to be saying carbon13 dating could vary greatly even within relatively small geographical regions and that measurements should be made and compared others within the region. I think I also read that environmental conditions can change over time to give readings that may be inconsistent with current conditions. First חג שמח המצות to all who try to follow Torah. Second, re radiometrics: I think you meant 14C, not 13. I wasn’t aware of this paper and it’s quite germane, so special thanks for bringing it to my attention. On the one hand, although environmental conditions certainly change over time, those readings are Wiggle-Matched to a radiocentric curve. It seems that this curve is what many are thinking is too simplistic to cover local and sudden atmospheric spikes that affect the rate of carbon decay (with associated fluctuations in 14C). Hagans acknowledges anomalies that others seem to have downplayed as insignificant. Like other researchers, however, it seems to me that his theory, while helpful, only fractionally explains the persistent anomalies. So far, I haven’t seen a satisfying theory to explain the effects, and projected changes in projections, associated with sudden, local and (relatively) short-lived catastrophic chemical changes in the atmosphere cascading to affect the rate of carbon decay due to solar filtration through a catastrophically clogged atmosphere as one would expect following the Santorini Eruption. I’m currently working on these aspects of the Yᵊtziah, but it’s still under construction. Because of the calendric relevancy right now, I’ll try to upload it as is and again when, בע”ה, when finished. Apparently their were extant pieces of the Torah written in Paleo-Hebrew found in Qumran. The website deadseascrolls.org.il has pictures of these. The dating is reported to be 3rd or 2nd century BCE. The words are separated by a dot, נקודה. This dot separation of words is also found in older Hebrew and Aramaic inscriptions that can be seen in, “The Book of Hebrew Scripts,” by Ada Yardeni, 1991, Carta Jerusalem. My question is could the text in Even Bokan be the authentic words, אותה ונקודה, of Y’shua since it uses both Hebrew words that describe accurately texts that exist/ed? But objectively, the Hebrew text of Even Bokhan in this portion describes well the extant fragments. Other portions of Even Bokhan do not, while NHM sources ALL related texts for a far more informed text. Learn NHM in its entirety and you’d be aware of these. Is there an alternate fruit that can be used in place of the Etrog? The crop was affected by a freeze and a shortage is predicted of 80% which means I may not be able to get one. “New research from Tel Aviv University reveals that citrons and lemons were clear status symbols for the ancient Roman ruling elite…,” not growing wild and abundant as I had conjectured. This research asserts that all citrus arrived in the Middle East too late to be the Biblical “פְּרִי עֵץ הָדָר” (fruit of ‘the splendorous [i.e., citrus] tree,” wa-Yiqra 23.40) refers to the אֶתְרוֹג (etrog; citron). Whereas until now researchers admitted they didn’t know and conjectured citrus, now we must continue to admit we don’t know but that research suggests that, in Biblical times, it was not citrus! My guess, pomegranate. Although I discount the usually-cited European Medieval rabbis as too far removed from both Biblical AND modern understanding of authentic Torah, Talmud Bavli (Seider Moeid, Tractate Sukah, p. 35, side a) specifies that “פְּרִי עֵץ הָדָר” refers to the אֶתְרוֹג (etrog; citron); and that dates back to the 5th century C.E. So authenticity and faithfulness to the most ancient documentation, which is the top priority in restoring the pristine תורה term, הדר (citrus, splendor, majesty), that would be recognized from Avraham through Ribi Yᵊhoshua is well-settled: אֶתְרוֹג. On the other hand, even the most strict Ultra-Orthodox Jews have lost all touch with authenticity when it comes to horseradish, salt water, celery or lettuce in the Pesakh Seider. So, substituting any citrus fruit can be no worse than what even the strictest Orthodox do in the Seider. In such matters, the Nᵊtzarim are more strict about adherence to ancient Torah authenticity than any Ultra-Orthodox. But availability in the Diaspora is not the same as availability in the Sinai and here in Israel. These substitutions seem to all track back to some shortage or inability in the Diaspora to obtain the authentic item – not unlike your dilemma. What’s ok (substitutions of something similar when the authentic is unavailable) for them to do is ok for you to do. Almost certainly, in the same way that dandelion and Syrian oregano were originally used in the Pesakh Seider because they grew wild widely and abundantly in the Sinai and Israel, so that every family could simply go out and pick some freely, the אֶתְרוֹג was probably the citrus equivalent, growing wild widely and abundantly in the Sinai and Israel in Biblical times. These were popular items in wide usage by the people in Israel; not odd, foreign, hard-to-get items. By contrast, in the Diaspora where the אֶתְרוֹג does not grow wild nor is widely abundant, other citrus fruits may be more accessible, making them the Diaspora equivalent of the authentic אֶתְרוֹג. Taking all of this into account, however, Jews celebrate such things in a community of at least 10 persons; a minyan (which requires appointing a Beit Din). So whatever the Beit Din of the minyan decides should dictate your choice in such matters. Most critically: in any case, if circumstances make it reasonably necessary a use substitute then, in future years, when the אֶתְרוֹג again becomes available, restoring authenticity is the priority, NOT establishing yet another local “tradition” to blindly follow like the Ashkenazim, and even Sᵊpharadim have done with horseradish, celery, salt water, etc. since at least the European Dark Ages and Medieval times. Celebrate Sukah as authentically as you reasonably can and enjoy! I am hoping there is a bumper crop in ישראל ! There is a solution to the אֶתְרוֹג problem. They grow the correct variety of אֶתְרוֹג in California. I ordered my set through: http://theesroggrove.com/ and it doesn’t cost $500.00 each! Tisha b’Av how is it viewed from modern orthodox? Modern Orthodox practice is generally standard Orthodox practice, simply giving priority to Ribi Hileil over Ribi Shamai (as the Ultra-Orthodox exaggerate to extremes). If you don’t find exceptions in our website (www.netzarim.co.il), then Ribi Hileil Orthodox practice (contrary to Christian idolatry, Ribi Yᵊhoshua’s teachings followed Ribi Hileil) is the נְצָרִים practice as set forth in our website — with which you should have a working familiarity. For the standard Orthodox practice, you can search the topic online and look for the answer given by the Virtual Jewish Library and, where they differ, follow Ribi Hileil rather than Ribi Shamai. שלום פקיד my wife and I are looking to bein Israel for the Hoildays is there accomidation in Raanna. We haven’t looked into hotels, hostels or B&B but once or twice since 1983. So we haven’t been in that loop and, consequently, I can be of only limited help as follows. Most tourists come in sponsored groups where they’re herded around as a group. This keeps them pretty safe and they see most of the things that most are interested in; and all while staying and eating in nice places and traveling directly to and from sites from a-c buses that know where they’re going and don’t lose the limited time being lost and unable to find their destination. But it also means that Jewish groups avoid Xn sites (99% a good thing) and Xn groups stick exclusively to churches and the like while remaining as blissfully ignorant of sites primarily of interest to Judaism as they were before they came. You’d be better off staying home and save the money than touring with a Xn group. If you come in a Modern Orthodox (or other Jewish group guaranteeing כשר accomodations) you’ll be WAY better off. Don’t, under any circumstances, come with a Xn group. If you don’t come in a tour group, getting around and finding places while avoiding trouble spots, especially if you don’t speak some עברית, will, at times, be challenging or, if you get lost, may even be extremely dangerous. You don’t have to be an Orthodox Jew to tour with a כשר Jewish group PROVIDED it’s Modern Orthodox, NOT Ultra-Orthodox (חרדי or חב”ד or any black hat), and that you let them know you’ll be compliant with their standards and are eager to learn to emulate how they do things (and you’ll need a כיפה: knitted, not black). If you take a cab, I wouldn’t ride with an Arab driver. Their name and picture is prominently displayed in their cab (or they’re not legit). So it’s easy for most to distinguish an Arab name from a Jewish name. I’ve found most Jewish taxi drivers to be honest and helpful. Driving with the meter on is usually more expensive IF (!) you settle the price BEFORE YOU GET IN the cab. Settle this first, OUTSIDE the taxi. (Once you’re inside, then you’re on your way and have no negotiating position. You pay what he insists. Problems are rare and there are people to complain to if it’s unreasonable, but you can avoid the problem by getting the price outside the cab.) There are standard rates and these are better than paying the metered price. You can find out from your host where you’re staying, to phone the nearest taxi stand for you (don’t accept “too busy to phone”), what the standard rate is to wherever it is you’re going. Rates also differ for time of day (rush hour, after 1800, etc.). One of the greatest shocks to me when I first visited Israel as an American tourist in 1983 was that there are no motels in Israel. Lacking the copious open space to which Americans are accustomed, Israel is too cramped for space to authorize building of space-devouring motels that cater to a motoring crowd that doesn’t exist here. There are motorists, of course. But in this small country, nearly all business trips conclude with a drive home. So there is neither demand nor space for motels. One is limited to a hotel (expensive), a hostel or a B&B (good deals are good deals but bad deals could be an expensive rip-off; plus, you probably need to speak Hebrew). Accordingly, the only hotels are in bigger cities, especially resort cities. רעננה (Ra’anana) is neither and there is no hotel in רעננה. One thing you should be prepared for is that if you expect to go to a restaurant on שבת then you won’t find כשר food unless you’ve made some kind of arrangements in advance. You can make arrangements in advance to eat on שבת where you are staying (except maybe, some hostels). All כשר restaurants are closed on שבת. That can make for discomfort on שבת. Finally, if you’re coming during a חג you’ll need to make arrangements for any Jewish observances, how to walk to (!) the closest תימני or Modern Orthodox בית כנסת. I think, during סוכות for example, every כשר hotel will have a סוכה in which you can eat daily. (So will restaurants, even non-כשר restaurants; so don’t assume a סוכה means it’s כשר.) But hostels and B&B probably will not unless you stick with כשר accommodations (in which case, you’re expected to know כשרות and KEEP it כשר). These kinds of things you’ll need to verify with whatever host you choose, as part of your choice. This is all I can think of. Hope it helps and you have a great visit. Thanks so much for your comprehensive answer. Has the Paqid been approached by the frist fruits of zion to merge. Do ffoz recognise the 135post church as authorities? The Nᵊtzarim are a historical part of Torah–moderate Orthodox–Judaism. We don’t entertain overtures of merging with anyone; nor are we interested in recognition from anyone else since all others who claim to be “Netzarim” are phonies and deceivers who have plagiarized the name “Netzarim” from me. The term “Nᵊtzarim” was lost since soon after 135 C.E. and remained unknown until, as part of my research, ha-Sheim showed me–not anyone else–the name and I restored it to use in the early 1970s. There is a considerable number and variety of fakes who are nothing more than self-aggrandizing, Paul-like empire-builders proliferating official-sounding offices for themselves and posing as “Netzarim.” Moderate Orthodox Judaism is legitimate, and the Nᵊtzarim are part of that. All others, including those falsely claiming to be Netzarim–who attempt to set up structures, clerics and titles, or a hierarchy separate from moderate Orthodox Judaism–are phonies and deceivers who are not part of moderate Orthodox Judaism and, therefore, not part of the Netzarim subgroup of moderate Orthodox Judaism. Are we able to claim a filiation with Netzarim or is there more involved? You said and I agree for conversion we must be honest and truth full in what we believe. I or we believe that Yehousua is the Mashiach. Torah living and teaching Rabbi. Called all to teshuva to haShem quodesh echad. As the church of jc did not exist there is no need for coment. So in conclusion there is only 2 shul in Canberra chabad and an orthodox and conservative jewish centre. Purhaps a moderate shul may egistance in Sydney or Melbourne. Or purhaps just continue as we are? Does the Paqid have a view or additional advice? A major problem is that Judaism, itself, has been going, and continues to go, through a significant period of introspection for the last century. Modern educated Orthodox Jews find Medieval superstitious “Judaism” impossible and incompatible. That, too, is something you’ll have to study and develop a working familiarity; becoming fluent in the nuances distinguishing various types of Ultra-Orthodox (including Khab”d and most “Orthodox shuls”), Orthodox (including moderate, Modern, nationalist, Zionist, etc.) and the continual proliferation of new versions of non-Orthodox and even irreligious Jews. The difficulties involved include many parts of the world still lacking a moderate Orthodox community, beit kᵊnesset and rabbi(s). (Even then, not all moderate Orthodox rabbis are up-to-date in their scholarship concerning the Nᵊtzarim.) “Conservative” Judaism means different things in different parts of the world. How all of these interrelate and why is essential to understand because you aim to become part of that community, know where you belong in that community and why. All of the answers to these questions, including developing your moderate Orthodox practice of Torah from Shabat to kashrut to praying, khagim and everything in-between, must come from a moderate Orthodox rabbi. In many parts of the world that’s still not possible. Even where there are moderate Orthodox communities and one or more moderate Orthodox rabbis, it is daunting to learn so much that is alien to non-Jews; especially learning to read, write, pray and at least communicate a little in Hebrew. But that’s your situation. Fortunately, Torah requires only that you do your utmost. So you must do your best to accomplish all of this beginning with relating to, and learning from, the Jewish communities available to you (and others, wherever they may live). Can I get someone to communicate in French, please? Wish we could. However, we’re only able to communicate fluently in English. With the infrequent help of a translator, we can hobble along in Hebrew. In the areas we discuss, Google Translator isn’t adequate to convey slight differences in meaning that can create enormous misunderstandings. שבת שלום פקיד i have 2 questions 1st what is Netzarim on Kararite teaching. 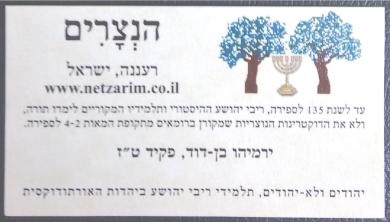 2nd does Netzarim have first post of call for person from church searching the website address? 3rd my wife and I will request gerim statue as Netzrim. This request must be in writing? I understand Netzrim do not do conversion this would be another step toward deeper Torah life commitment. 1. There is only one right Way, which I’ve described extensively in my books and the Nᵊtzarim website (www.netzarim.co.il). Logic then excludes all others, which is an endless, and constantly growing, list. I determined decades ago that there is no future in getting sidetracked into dealing individually with each instance of an endless and growing list. 2. In our Home Page—the Nᵊtzarim Gate (also depicted at the bottom of the navigation panel at left), there’s a Virtual Tour at the bottom of the last page of each section that guides you through our Virtual Village. 3. For many years, it was essential to have a “hands on” denial of the countless Christian phonies who falsely claimed to be Nᵊtzarim. We’ve now well established for decades, in both the Jewish and Christian worlds, that there are no Nᵊtzarim in the Christian world and that it is impossible for a Christian (or a believer of the NT) to be a Nᵊtzarim. This, coupled with the basic understanding by a small number of moderate Orthodox rabbis that we are logical-halakhic moderate Orthodox Jews, makes it no longer necessary for me to personally recognize or deny who is intent on practicing logical-halakhic Torah-practice, as this small number of moderate Orthodox rabbis now do as well—and this is where future would-be Nᵊtzarim must seek acceptance. This is a weaning process. Future would-be Nᵊtzarim must publicly (not secretly) maintain Nᵊtzarim beliefs (as set forth in my books and http://www.netzarim.co.il) while learning and conforming to the logical (!) aspects and practices in the moderate Orthodox Jewish community—via finding a modern-oriented and open-minded, moderate Orthodox rabbi who is sympathetic to your desire to practice Torah according to scientifically-logical halakhah. (It’s not an easy search. They’re still pretty rare.) It is impossible to practice Torah independent, or artificially separated, from the moderate Orthodox Jewish community. שלום פקיד תמני סדור ץושה it have the different marks to represent the additional alef bet consients. When I go to NQ Iam having trouble scrolling down just opens on page. Not sure wether it is my problem or some thing at site. Has any one else had problem? No one else has had this problem that we’re aware of. I have this problem and I just open a new link in a new window to remedy this. Didn’t know others were also having the problem. What browser(s) are yall using? Does a scroll bar display at the side? Are you getting both the white background navigation panel AND the blue Home Page? Or only one or the other? ipads have this issue big time. on my laptop I use Firefox, I can scroll down but it is very narrow. I found I can right click what ever link I need to open in a new tab. But to go back to the original page I need to keep that open. Links from the opened tab do not have the menu on them. The church is reference to Satan followers of the 4th century. I was thinking, later, about the term “Master” that you used. That’s not the term the נצרים use and it’s confusing (if not to you, then to readers), bringing up questions of the proper Hebrew: it’s unclear from the English whether you intended אֲדֹנָי, as Christians would assume and imply, or אֲדֹנִי — neither of which conforms to the examples in NQ, NHM and our other books and papers: ריבי יהושוע. It’s always risky for anyone not thoroughly acquainted with Orthodox Judaism to diverge from the paradigms given in NQ. You’re unaware of the strayings you may be initiating. I recommend not diverging from the lexicon paradigms in NQ; and certainly not when it perpetuates, or may appear to confirm, Christian (or Muslim) lexicon or perspective. In all this joy I feel and the path before me. It is disturbing to realise that Satan has since the 4th century masked him self in the image of the son of god to murder and accuse the children of HaShem quodesh echad the children of ישראל. It amazes me that the church of love is covered with the blood of Jewish children, forced conversions, and then drownings and burnings at the stake because they were judged not real converts. The madness is the madness of the anti christ. Not our beloved Master Yehoshua. His name and his love for HaShem quodesh echad should not be blasphemed by this satanic lie or his church. You’re getting the gist correct. Some minor adjustments in spelling and terminology can be gleaned from further focus on the information and examples found in http://www.netzarim.co.il. Some of your terminology is still Christian baggage not yet sloughed off. A point in your previous post: we eschew the assimilation of German and Hebrew (namely, Yiddish). I see loads of progress. One thing I don’t get, though, is the last phrase: “his church.” That’s an oxymoron. Keep up your study of NQ (the Netzarim Quarter, http://www.netzarim.co.il) until you’ve absorbed and digested every page. If you don’t understand something in NQ, that’s a good question to clear up. This way can be difficult confusing. Looking for an ending. Or start a journey with life change copacity that is new everyday that never ends. Eachday we just rest at the end of each day. For the first time i see the time wasted. אתה ברוך ה שם אלינו מלך ה העולם אשר קדשנו במותו וצונו בקשו הדרך. It really is harder to post these things than it seems 2 ways life or death. I choose life and ha Shem’s quodesh echad way. 1 step at a time what a blessing. How blessed am I to realise we can all choose this journey. Sounds like you’re getting it. Stay the course. שבוע טוב. Or start a journey with life change copacity that is new everyday that never ends each we just rest at the end of each day. For the first time i see the waste of time. אתה ברוך ה שם אלינו מלך ה העולם אשר קדשנו במותו וצונו בקשו הדרך. שלום what is the Netzarim position on re incarnation? Is it in the cChumash or Tanach? Again, you’re distracted from your supposed practice of Torah to some irrelevant wild goose chase. Is solving this question somehow necessary to your weekly study of the weekly Torah portion in our Beit K’neset pages? To kashering your kitchen? Learning your Hebrew Nosakh Teimani liturgy? Concern yourself with how you should apply Torah in your personal practice and that will take up the rest of your life. Yes I understand no it won’t help. I see the direction. Many thanks. Could you elaborate on jubilee for upcoming year. This is a public blog centered around Torah and Israel. If the question is something you’d rather not be public then the question isn’t appropriate for this blog. We discuss things that are peripheral to Torah and Israel like Torah outreach to people everywhere and how that trickles down to everything from morals to guns in a Torah-based society. If one is absorbed in learning and practicing Torah then I think this is where their questions will be. If this is not where their questions are then that’s evidence that they’re focused on the wrong thing(s) and need to refocus. I just came across a Rabbi yitzahak Kaduri is he or was he a Netzrim? Perhaps; it seems he may have found his own way and he was certainly Torah observant. I didn’t know him personally. I’ve been approached by people offering to help anonymously. However, as a personal policy, I’ve always declined any kind of association with any anonymous person. No way to tell who you could be hooked up with and not know it. Do Netzarim tie 7 or 13 chuliot and what is the reasoning? I have heard 7 relates to 7 heavens and 13 to Hashem’s quodesh echad quodesh attibutes? It’s all in NQ (the Netzarim Quarter, namely, our website: http://www.netzarim.co.il). Info is in the Teimani (Yemenite) shop, in the Mall. I do apologise for the question on the eve of the khag. We were able to prepare in time. Is there realities we should be incorporating or should understand with upcoming khag. I am counting the omer each evening. Is there more? It’s not possible, from far away, to notice how your practice may be differing from the basic practice of the moderate Orthodox Jewish community. The only way for you to discover that is to be in a close enough relationship with a moderate (not ultra) Orthodox Jewish community to notice how you may be doing some things differently from them. 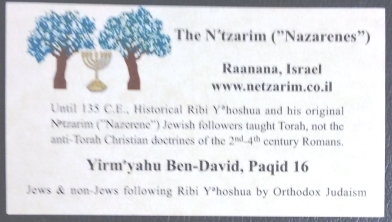 Then you can refer to my books and the Nᵊtzarim website (www.netzarim.co.il) to learn which way is Scriptural. Sometimes they make mistakes too; and in some ways many rabbis, even some moderate Orthodox rabbis, have strayed from Scripture. So, other than advising you to keep up with learning עברית, following the Judaic calendar (including the פרשות תורה) and what you learn in my books and the Nᵊtzarim website, only you can answer those questions by interacting, at some level (doesn’t mean you have to convert), with a moderate Orthodox Jewish community to see how your practice may differ. Good to hear that you’re counting the עמר. Keep up the good work. Could you speak on the Netzarim and the pasach is there documentation that the pasach was observed. Is there a tradition that would be a pliable or is the festival perfect. Preparation for the Pesakh Seider and Khag ha-Matzot begin a couple of months before Pesakh, planning to reduce purchases of everything containing khameitz or s’or to run out of most before Khag ha-Matzot in order not to have to throw away a lot. At this late date, we’re all way too busy with our own preparations to write an article. Do what you can and get an earlier start next year. As soon as one khag is over you should be looking at what to begin preparing for next. Gotta get back to our own preparations. Could you speak about how we act in the face of the progressive left and atheistic governments with parallels to the Roman Empire of the past. Could you speak on worship / tehillim? May this time of chanukah be a safe and real time of miracle for all of Israel. Could you give your understanding of who homosexuality and the rasing of children by homosexuals and those openly discourage our grand children to to believe haShem quodesh echad exist. What is the torah communities halacha on this issue? Could you talk about the temani relation ship to Netzrim communities. Could you talk about the orthodoxy of the Torah community of the way. How can we live apply this here in diasapra. Todah for your question. בע”ה I’ll post an article.